1870 U.S. Census, Rondout, Ulster Co., NY, Pg. 162, dated 13-Jul-1870. Well, some of my readers will question this being Layton & Marleah Kanistanaux, and I certainly do question it myself. But I can’t overlook the possibility either. First, Marleah is not a common name. Second, they are both Indian, and the man is a doctor. Third, the ages are in the right ball park. Of course there is the rather obvious negative fact they both claim to be born in California, which is not a match to what I know about Layton & Marleah. In this census, Marleah is not called a doctress, but she is referred to as the wife of the Doctor. Should I believe this 100% and should I believe they are both from California? I think not. I always greet information from Indian Doctors, basket makers, and other public entertainers with a large dose of skepticism. They are in the business of telling the “white” public what they want hear without regard to the validity of their tale. If this man and woman are traveling together and sharing rooms, they would need to appear as husband and wife. It would be improper to the public eye if they were not married. The census taker would most likely address the gentleman when asking questions. 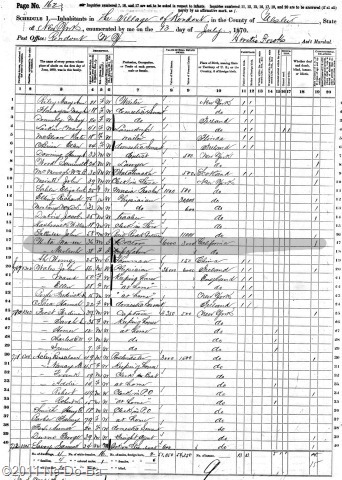 The census taker could have easily assumed she was his wife and came with him from California or U-ta-wa-un could have given that story to the census taker. My next step will be to learn what I can about the name U-ta-wa-un, since it should be rather unique. I won’t be adding this information to my data base until I learn more about the couple and can establish some foundation for believing this might are Layton & Marleah. Is it possible the one named U-ta-wa-un generic for one from Ottawa? Thanks for the thoughts. An interesting possibility. Certainly anything is possible. However, it is way too early in the research process to start making guesses about this name. First, as a researcher, I should learn as much as possible about the man and see where it leads me. Once that is done, I will be able to formulate educated guesses – a much better use of valuable research time.